As you delve deeper into a subject you often find you disseminate the not useful from the very useful in a short period of time. The internet helps you work things out through forums and galleries of online pictures – I bet within a minute with a decent internet connection you could find a decent walk around of whatever military vehicle you could think of. Myself I will check many references, all around the place – and it does take a little time. If I am going to spend money on a book I want it to be BETTER than what I can find on the internet. Otherwise, the book is pretty useless as you will go to the net first. Not just me but less internet savvy researchers (like my dad) are turning to Google image search to find what they need. Having read Reid Air Publications books recently and becoming an advocate for their quality walkaround books I have been looking for something to match. I had heard good things about DACO’s books and so decided to look at their books to see if they were up to the ever increasing standards my research had enlightened me with. I have a dual purpose of reading their latest book on the Starfighter called simply “Uncovering the Lockheed (T) F-104G Starfighter” as I wish to make the new Italeri F-104G kit in 32nd scale. I wanted to be prepared when it came. 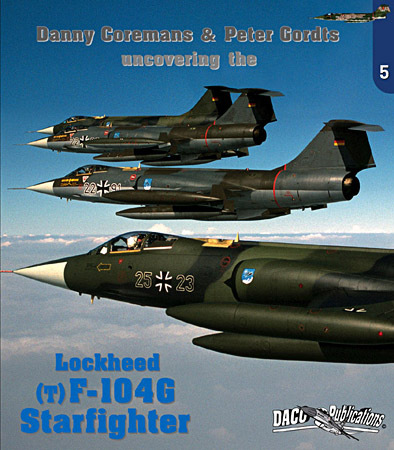 The book details both the F-104G and trainer/two seat TF-104G Starfighter (and indeed 24 pages are used to uncover the TF-104G twos-eater separately). Several nations’ aircraft are documented, with a strong presence of German and NATO aircraft especially. It is nice to see two different nation’s aircraft next to each other in detail often compared and contrasted in the one spot and the differences explained to you. I cannot do a blow by blow of what is in this book without practically writing the whole thing. This isn’t a book you might read in one sitting, and if you read it over several days you may need refreshing with where you got to. Don’t feel bad because you would have to have a perfect recall to remember it all. There is so much detail on hand here that this title is best reduced to finding what you need to look at after you have read it through. Each part of the aircraft covered is notified in the top corner by shading the pictured parts of the aircraft in red on a small diagram. Indeed some of the detail parts are so in-depth that if you didn’t have this you may get lost. It is a small but great feature to help you recognize just where you are at. Every conceivable part of the Starfighter is shown in the picture, including aircraft that are at the end of their service lives (great for weathering reference) and even 16 pages of maintenance pictures even though the aircraft has ended service – these are a rare and very worthy addition. In amongst the detail pictures, there are features like a series of shots that show off the series of motion involved when the Starfighter retracts its complicated main landing gear. This shows so much more than a picture of the gear up and down. Indeed I learned so much more about his aircraft than I ever would dream of knowing if I had looked detail pictures up on the net. Wings, wheels, cockpits, antennae, wiring, instruments, seats, engines, exhausts, internal panels, t-shaped tails and intakes – this book also covers pretty much every single weapon and ordinance the G model ever carried. From the nuclear weapons this aircraft was to drop in the worst case scenario to the missiles, bombs, rockets and tank to the gun and the ammo it shot – there are twenty pages of detailed pictures here again thoughtfully and thoroughly laid out. Details of the pylons and pods the aircraft carried – which did and did not have these are also talked about in the text. To top off all of this detail you are given two large fold-out pages in the book – measuring about a metre long you are provided with 1/72nd and 1/48th scale drawings of what I understand to be the most accurate drawings of this aircraft on offer – drawn by the author Danny Coremans. Cockpit layouts are also included for both the single and double seat Starfighter; these are drawn up by Willy Peeters. Indeed since learning of this title and speaking to the Publishers of this book, I have found out that they helped in the production of the new model from Italeri. I think that with the help of DACO this will be an excellent kit. DACO has already produced the most detailed decal set for this release, and anyone reading this book will know that their work can be implicitly trusted. Well I don’t like to gush but you should be able to tell how much I would prefer this book over anything I could find on the internet or anywhere else for that matter. The photography is excellent and well shot, the text is informative beyond the norm and the knowledge I got from this book surpasses any I have gotten from any other source since starting my research on this aircraft. Take a look at the product page of this book at the top of the review and see what many others have written and you will see I am not alone. If you like the Starfighter – then get this book – even if you just like cold war jets – it is a must. Don’t bother with Google image search whilst you have this hefty little book in your hand. This is your F-104G one stop shop. Thanks to DACO Publishing for this book to read and review – so you know less than 100 copies of this book remain in stock with DACO – so if you want one after reading this review you had better order sooner rather than later.